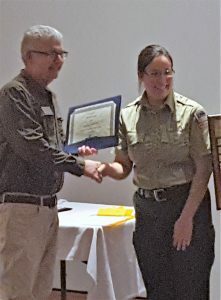 Neal as an individual dedicated over 500 hours of community service to the State Park. Neal has been familiar with the Ohio River for quite a while. Besides volunteering here at the Falls, he worked for a barge line on the Ohio for roughly 30 years before retiring recently. Neal is a great example of the quality of volunteers we have here at the Falls of the Ohio State Park. He works tirelessly in many capacities, and comes in to assist whenever there is a signature event, a great need. He can often be found roving the fossil beds on weekends, sharing his knowledge of the area, fossils, and the history of the Falls with countless visitors.